Cheap Thrills is a comedy as black as Hitler's soul (but much less racist). Cheap Thrills is one of those movies that’s like a highway accident:You hate yourself for watching but you just can’t look away. The movie is a smaller indie affair so it’s a good bet that you haven’t seen it or even heard of it yet. You must seek it out. The movie starts off with Craig (Played by Pat Healy) at home with his wife and newborn child. Immediately we get the sense that Craig is just barely scraping by in life. As Craig is leaving for work he sees an eviction notice stuck to his front door. Apparently Craig is $4500 behind in rent. As if this isn’t bad enough, Craig gets fired from his job the same day. Having hit rock bottom Craig decides to grab a drink at a local bar. While at the bar Craig runs into an old friend that he hasn’t seen in years, Vince (Ethan Embry). The two get to talking and it’s revealed that Vince has a rather unsavory career: he’s a leg-breaker for a bookie. Right off the bat we see that the two men appear to be very different. Vince is tough and street smart while Craig is struggling to be a good husband and father and has abandoned whatever kind of mischievous past he had that would involve him with someone like Vince. The two friends are approached by a husband and wife to come sit with them at their table in celebration of the wife’s birthday. This is where the movie really begins. The couple, Colin (played by David Koechner of Anchorman fame) and Violet (Sarah Paxton) carry an insane amount of cash on them and they start offering money to Craig and Vince for various dares. It starts off with $100 for the first person to take a shot, and quickly escalates. The four of them end up back at Colin and Violet’s house and the dares start to range from $1000 to whichever man can drop a deuce in the neighbors living room without getting caught, to $15,000 to cut off a pinky. 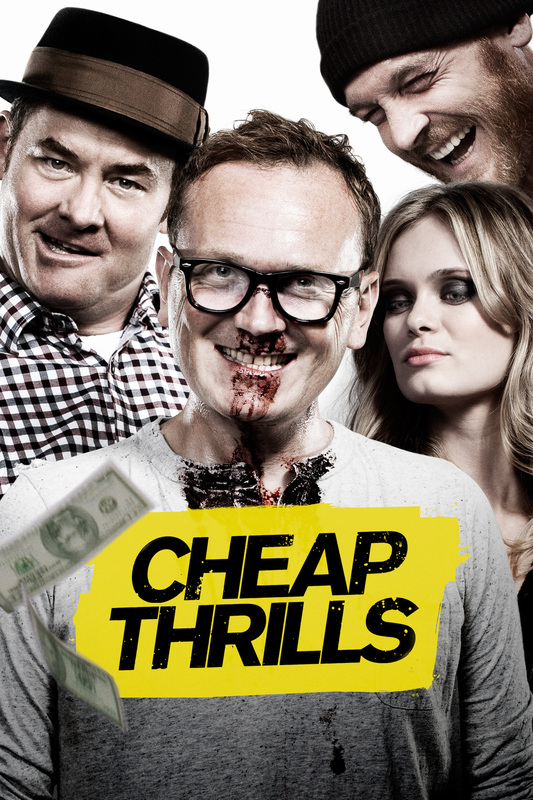 Cheap Thrills is basically the adult version of “What would you do for a Klondike Bar?”. Both men sink to savage depths of depravity in hopes of earning more money. It’s particularly interesting watching Craig go from devoted family man to basically a beast, all in the hopes of saving his house and providing for his family until he can find a new job. Money as they say, is the root of all evil. Cheap Thrills is a character study in the vain of Lord Of The Flies in that the film explores how quickly civilization, morals, and basic human decency can go right out the window with the right catalyst, whether it be money, or isolation from society. We act as though we are this advanced species but every now and then we see just how thin the barrier that seperates us from animals really is. 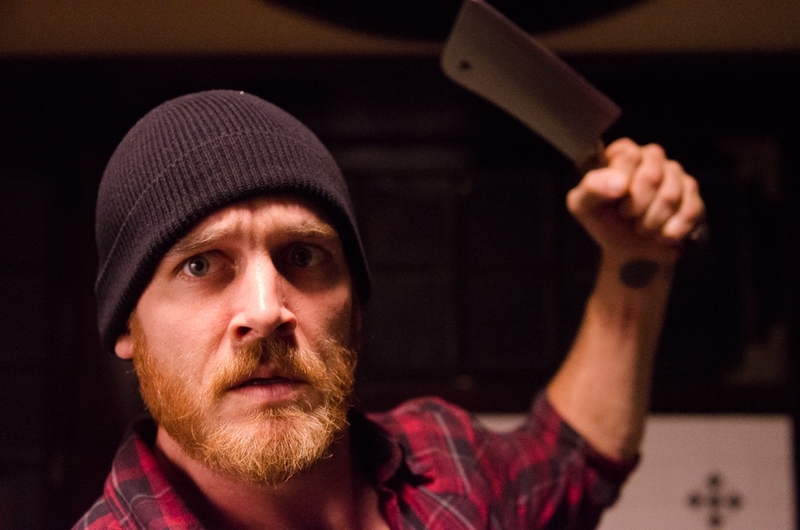 If you like your comedy’s dark like burnt toast, you’ll love cheap thrills. A warning to those with sensitive stomachs: A dog is cooked and consumed, so avoid if you think that you can’t handle that. You wussy.